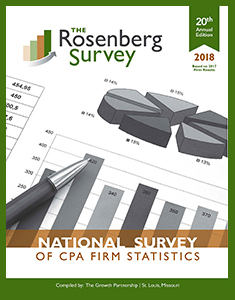 There’s exciting news from our 20th annual Rosenberg Survey, which reported on 2017 results. Perhaps the iconic phrase from Star Trek’s Mr. Spock is pertinent: “Live long and prosper.” CPA firms continue to grow and post impressive profits, as good a definition of “prosper” as there is. Firms are not living long, as evidenced by the continuation of the decade-long merger mania. Some major industry trends continue (struggles with staffing and succession planning) but there were also some startling changes in several areas. NOTE: 58% of the firms surveyed have annual revenues of $2-10M, 20% are $10-$20M and 9% are over $20M. The average revenue of participating multi-partner firms was $10.5M. Revenue was up 7%, somewhat lower than last year’s 7.8%. When we drill down and sort the growth between internal and merger growth, interesting results surface: 4.3% internal vs. 2.7% from mergers. This means that 39% of the industry’s growth came from mergers, up from 26% last year. Maybe the time has come for our industry to stop talking about growth from mergers as though it is somehow temporary or unusual, not to be considered “real” growth. Growth by merger is a frequent and normal occurrence in all industries, as is now the case with the CPA firm industry. A more pressing and perplexing issue is this: In a strong economy, why are CPA firms only able to post a modest 4.3% internal growth? Firms active in mergers tell me internal growth is a challenge, thus growth from mergers is an attractive supplement to organic activities. In our complete survey, we list 6 reasons for the sluggish internal growth. Profitability, measured by income per (equity) partner or IPP, increased to $441,000, up only 2.6% from last year’s $430,000. Revenue growth has far outpaced IPP growth for the past 10 years. Why is this? The major reason is mergers. In the majority of mergers, the seller’s partners earn less than the buyer’s partners. So, in combining firms, the IPP goes down. Another factor is partner buyout payments. For the first time in recent memory, this metric increased sharply, rising to 1.6% of revenue compared to 1.3% last year. With more Baby Boomers retiring, more partners are receiving buyout payments than in years past. (Maybe this will quiet skeptics who are anxious about partner buyout plans ever paying out.) A final factor explaining the sluggish IPP increase is that firms are raising the bar for becoming an equity partner, thus making do with fewer equity partners. So, one could say that the common thread for all these explanations is “it’s in the math.” When the issues above are factored out, it’s reasonable to conclude that profitability of CPA firms is very good. We can’t conclude this section on profitability without reiterating one finding we have been stating since the first edition of our survey in 1998: The straightest path to profitability is from strong billing rates and high staff to partner leverage. Many firms have inexplicably remained conservative on increasing their billing rates, but the aggressive ones reap the benefits. In 20 years of consulting, every firm I counseled to raise their rates reported higher net revenues as a result, with minimal client loss. Female partners now comprise 21.2% of all partners, up from 18.7% last year. It’s about time, isn’t it? Staff to partner ratio (leverage) was up across all firm sizes. Firms increasingly understand that promotong managers to non-equity partners rather than straight to equity makes sense, and that the bar for admitting a new partner needs to be kept high. The litmus test to become an equity partner should be one’s ability to drive the firm’s success. Consulting. Despite all the hoopla about consulting being the future of CPA firms, consulting at small and mid-sized firms remains sluggish. Most of the increased consulting work is being done by the large firms – say over $30M – as evidenced by the substantial amount of merger announcements these days in which large firms are merging in consulting firms, not just CPA firms. Partners at smaller firms are simply too busy to explore consulting. Technology is clearly the buzzword at CPA firms. Everyone’s talking about Blockchain, artificial intelligence and data analytics because of the life-altering changes to the CPA profession that are sure to follow. But the majority of firms see the true impact of these new technologies 5-8 years away. Technology expenditures are not changing much. To be sure, the Big 4 and a few of the largest regionals are spending big bucks in this area. My new favorite quote these days is Amara’s Law: “We tend to overestimate the effect of technology change in the short run and underestimate its effect in the long run.” This is a perfect explanation for where things are at. Bigger is Better. We’ve been showing this analysis for over ten years. The larger the firm (in terms of revenues), the higher the profitability. Good things happen when firms grow: The ability to hire high-level COOs, marketing, HR and IT directors; more active and sophisticated marketing; more specialization, attracting larger clients and more staff, more merger opportunities. $10-20M firms: MP billable hours=702, all partners=1,022. A 31% difference. $2-10M firms: MP billable hours = 1,019; all partners=1,022. No difference. This makes no sense to me. The most impactful factor in firm success, growth and profitability is management and leadership, primarily provided by a strong MP. Yet, as you can see, the billable hours worked by MPs at firms under $10M is the same as their other partners. MPs with these levels of billable hours can’t possibly be making the firm their #1 client. MPs should be spending lots of time leading the firm, mentoring and coaching partners, focusing on strategic plan execution, holding partners accountable, developing great staff and for some, rainmaking. I would posit that the heavy client focus of many MPs is holding back CPA firms’ success. Partner comp systems. 65% of firms with 8+ partners use a compensation committee to allocate income vs. 15% using formulas. But at firms with less than 8 partners, 34% use a formula and only 16% use comp committees. I do a ton of partner compensation consulting and a lot of it is moving firms away from formulas to a comp committee. So, those of you still using formulas owe it to yourselves to understand why larger firms use comp committees and why formulas retard the firm’s success because they are heavily flawed. You state Managing partners are way too billable. What do you believe to be the optimal billable hours (in a range) for 10-20 mil and 2-10 mil firms?